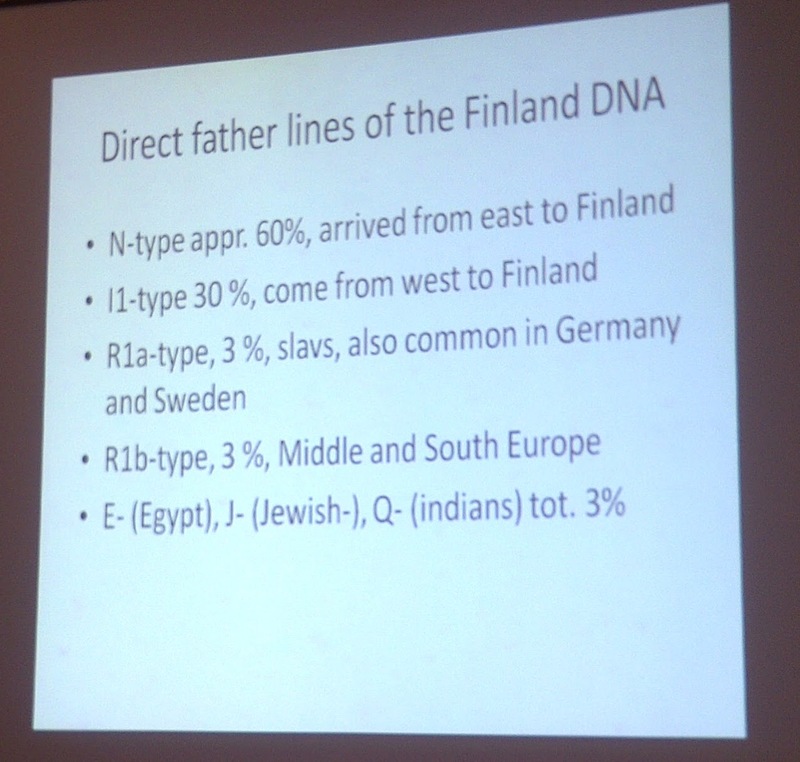 I attended several interesting genetic genealogy presentations at FinnFest yesterday. Some of the information was brand new to me and may be to you too. 1, FTDNA currently uses 62 subpopulation reference samples for Population Finder. Every time they update Population Finder with a new reference sample, they will rerun every customer's results. 2. FTDNA removes SNPs that have medical relevance from Family Finder raw data, but they do utilize them for matching purposes. 4. As of August 12th, FTDNA has 343,022 unique DNA records, 102,880 distinct surnames and ~6,500 surname projects. 5. FTDNA will be partnering with Elise Friedman's Relative Roots to offer genetic genealogy webinars. 2. There are 250 Finns in the Family Finder database. Worldwide Haplogroup X = 1.4%, Worldwide Haplogroup W = 1.6%. In Finland these run 3%-5% in some areas. The only other known hot spot for Haplgroup W is the Himalayas. 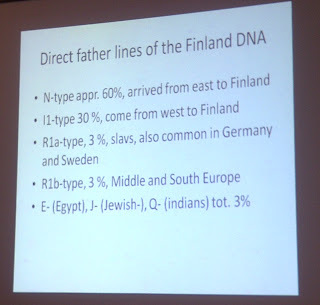 Lauri interprets the breakdown of the mtDNA haplogroups above to mean that most of the men who migrated from the east to the area that is now Finland did not bring wives with them, but rather married European women and Saami women enroute and/or when they arrived. 5. 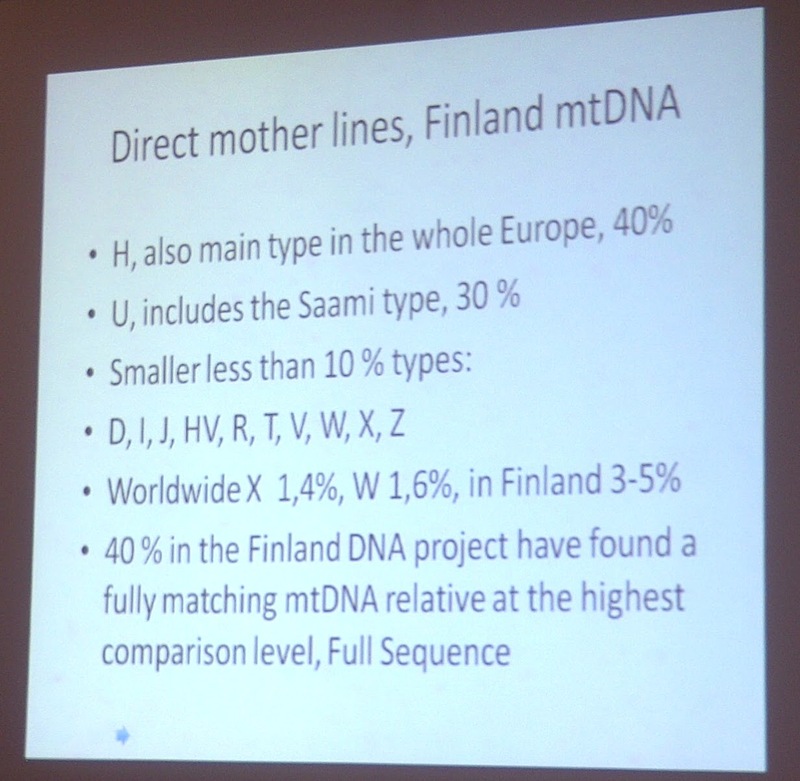 Currently 40%-50% of all members of the Finland DNA Project with Full Sequence mtDNA results have found matches. I will try to post the slides from my panel presentation "The Unique Finnish DNA" tomorrow. 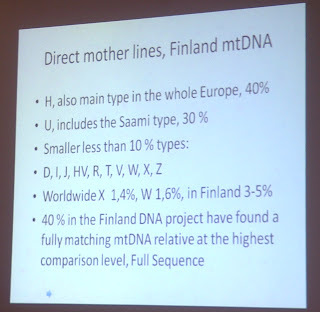 The Saami type mtDNA U5b1 is a very small fraction of Finnish U. Also, U and H are frequent in the Volga region and Northern Russia where a lot of N1c Y-haplotypes also exist. Thus the theory of catching new wiwes in Europe is false. But the share of H is indeed higher in Finland and Baltic countries than in Volga-Ural region. Most other European populations have also arrived from Asia. Europe was not a pleasant place to live during the Ice Age. Interesting Pikeperch. I am just reporting what was said at the conference and am not personally asserting any particular theory of Finnish origin. Thanks for commenting. But how -and where from- arrived the very rare U7 mtDNA in Finland? Any explanations? Finns are largely Asian (or Mongoloid) paternally, when one considers that 58% of Finnish males carry the N3 Y haplogroup. According to almost all genetic studies, the N3 Y haplogroup is of Asiatic Mongoloid origin, having originally developed amongst the Asians in South-East Asia over 14,000 years ago. These Asian settlers (or at least the male descendants of this group) then migrated to China, then from China onto Northern Siberia and then finally to the North-Eastern European regions of Finland, Lithuania, Latvia, Estonia, and parts of North-Western Russia. There these Asiatic Mongoloid N3 Y haplogroup males intermarried with the indigenous white European females. This first produced a hybrid population of Eurasians peoples, who were Asiatic Mongoloid from their father's side and European from their mother's side (MTDNA). Over generations and hundreds and thousands of years, as these mixed Eurasians descendants married more European women, the Mongoloid Asiatic components of the original Finns, North-Western Russians, Estonians, Latvians, and Lithunians were diluted further, until currently the Finnish population is considered to be about 10% of Siberian/Uralic or Mongoloid Asiatic descendant overall (meaning autosomally in genetic terms), although paternally they are entirely Asiatic (the N3 Y haplogroup) and entirely European maternally. The Uralic cousins of the Finns, and the North-Western Russians, Estonians, Latvians, and Lithunians in the Ural mountains and further east in Siberia such as the Nganasan, Nenets, Khants, Yakuts, Mansi, and others look far more Asian, since they are overall (i.e. genetically autosomally) more Asian and have not only overwhelming the N3 Y haplogroup genes from their paternal side, but also Asiatic Mongoloid MTDNA from their maternal side. Hence, the Finns and the North-Western Russians, Estonians, Latvians, and Lithunians are largely Asian and Mongoloid paternally and largely European both autosomally and maternally. Finns have the Asiatic paternal genes and no wonder like their East Asian cousins such as the Japanese, Koreans, Chinese, and others, the Finnish population and Finnish children and youth are amongst the top (similar to the East Asians) when it comes to education achievements, and abilities in mathematics and scientific proficiency. Very interesting. Thanks for your comment.